The task at hand here is for me to present a collage of photos. I have done some collages before, but it is a little tricky considering for this one I am using photos that I have taken myself (I do not take many). Most recently, I have taken several for the New Haven St. Patrick’s Day Parade a couple weeks back. When I was thinking how I could present these photos at once, I drew inspiration from the classic Rolling Stones’ album Exile on Main St., which features a series of photographs/postcards taken by Norman Seeff as the cover. For my featured collage, I used a series of photos (set to grayscale) and instead placed them behind a cork board (which, yes, I photographed). 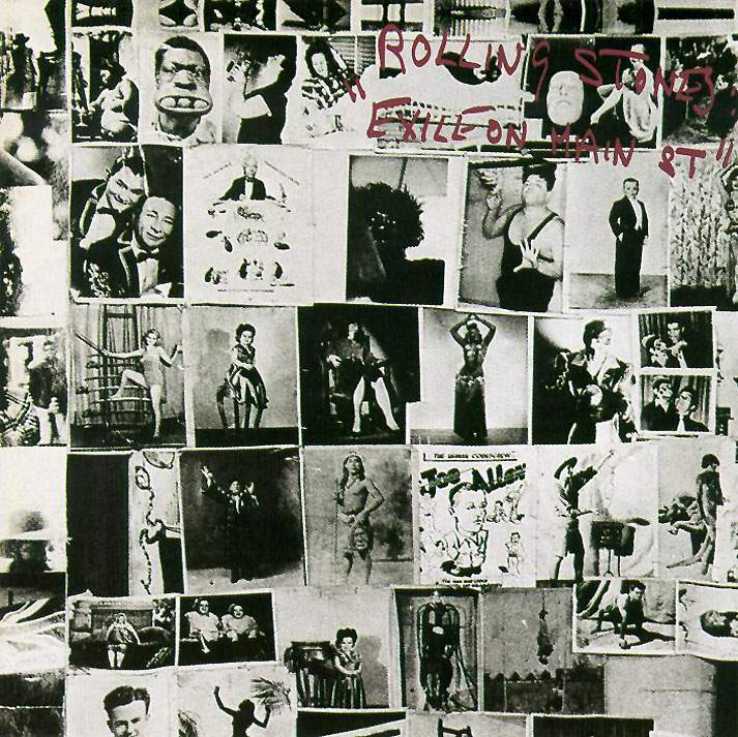 What I liked about Exile on Main St. was that the photos on the album were light in tone and featured some pretty interesting characters (some of which remind me of the Vaudeville era). For the parade, I did not get many pictures of the “actual” parade, but instead mostly my friends (who are characters in their own right) “mugging” for the camera. Blogetery in Motion - Exile on Crown St.
All of the original photos were taken in color, but converted in grayscale to have that Exile on Main St. feel to it. What was fun about creating this was there was several way to get the effects for the photos. For some I used filters (noise, distort, sketch) and played around with creating my own custom effects. Being the master at filters that I am not, I also chose to go into Image and Adjustments and play around with the color options there, which also created some pretty interesting effects. Unlike the Stones’ cover, I left a small amount of space for some of the photos so it was recognizable for the cork board to be seen. I chose Handwritten Dakota font and if you cannot easily make out the title, I created it that way on purpose (in homage to the original) and subbed out the red font for green in honor of the festivities. For the photos themselves, I created a border with the rectangular marquee then inverted and created a white border to give the feel of a classic Polaroid photograph. I also added in the drop shadow (but kept it light as to not go overboard with that effect), so there is a sense of layering with the collage of photos (overall there were 20 layers used for the photos). I titled the piece Exile on Crown St. simply because during the parade we all could find each other on that street (usually getting a slice of pizza at Bar). While the photos themselves can tell the stories of good times and overall silliness by people reluctantly entering adulthood, I wanted this collage to be a part of another one…the day after the parade. Again, another photo light in tone, which features more perspective (including the perspective on someone walking into my room after my long day). Basically the photo is yours truly the day after the parade (which I presumably fell asleep fully clothed and never made it under the covers, but at least I had plenty of water). 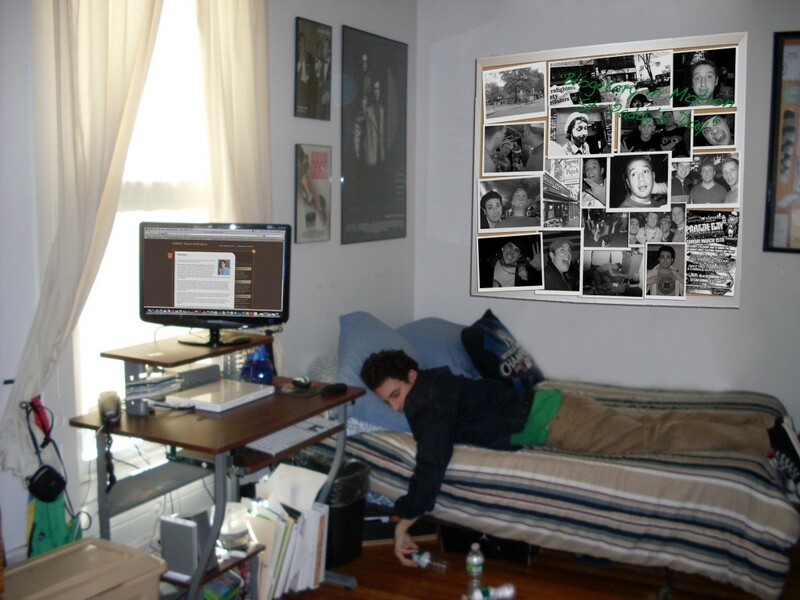 I made the original collage part of this photo and used the perspective transform tool to fit the angle of the wall. The computer monitor is tilted so you can see the screen and if you ICM 502-ers look closely you will notice the course blog placed in the screen (which I used the transform warp tool to fit a little better). This was another piece where I wanted to learn something I have not previously used, which in this case is the Clone and Healing Brush tools. Where the photo collage is, there was initially a window in the room, which I used the clone and healing brush tools to remove…to some success, but frustration. These tools are similar and do take some patience (it is particularly frustrating when Deke McClelland says, “New and improved for CS4″ and I am still using CS3 as I continue to wait for CS4 in the mail). Completely against Deke’s wishes, I used the Spot Healing tool, which works quicker…but created some undesirable effects along with it. Overall, it is extremely helpful to know these tools and I can’t believe I have gone all this time avoiding them. Overall, while my friends may not think all of their photos are in the most flattering light, I wanted the collage to tell the story of the St. Patrick’s parade seen through our eyes, some partying and the next day…some procrastination (as far as school work). There is a happy ending though…I got through the first module, so let’s bring on the rest! I love the way you decided to do your collage! I actually was going for something along those lines myself with a similar style. It looks like you had a lot of fun though! I get a sense of depth in the second photo with the collage in the background in your room. I think maybe a filter would have been useful or lowering the contrast a little more to make it really blend in might have been useful if that’s what you were going for. If you were looking to make it pop out more then you did a great job! I love that you’re just passed out with a water bottle in your hand. I definitely know the feeling . 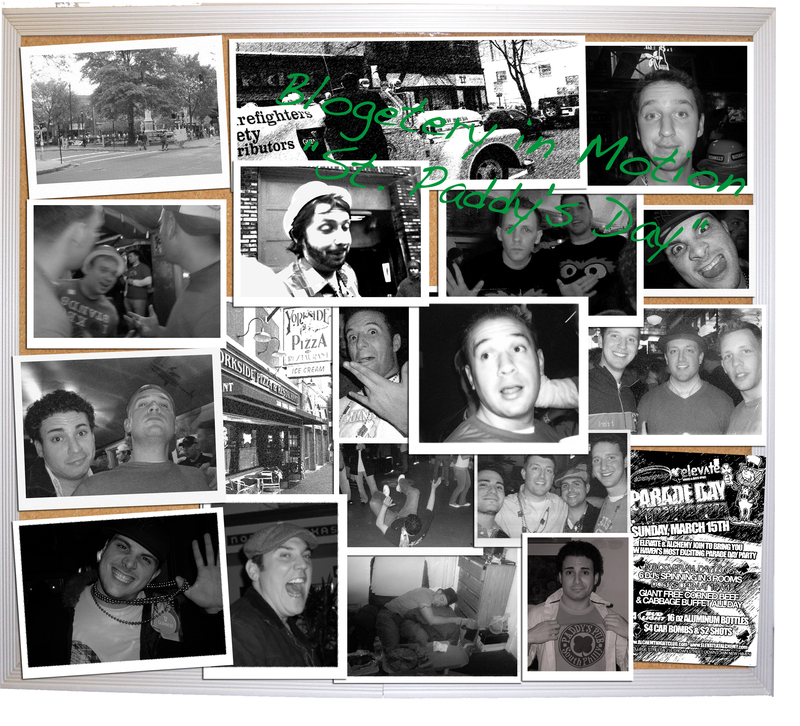 I also love that you even added the words Blogetery in Motion on the collage like the album. Good stuff! Thanks for the awesome feedback! I did play around with filters to blend the collage with the rest of the room, but the black and white photos came out too dark, so I tried to find a healthy medium and left it a little brighter, but good thoughts with the contrast. Yeah, this was a fun one to create, I’m going to have to check out your montage…Thanks!